Are you ready for their arrival to your beloved garden? 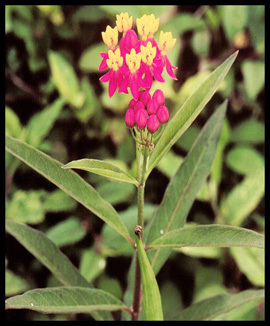 Have you planted enough milkweed to feed your brood of caterpillars that will no doubt be munching away all summer long? If you haven’t, then you need to get busy. 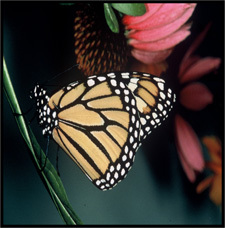 The Monarch butterfly Danaus plexippus will soon be feasting in your beautiful garden. So, you want to be sure to have lots of milkweed on hand to feed your hungry caterpillars. If you want to know how many leaves it takes to feed three monarch caterpillars from egg to pupation, then I recommend a healthy plant with no pesticides on it, that is about 24-36″ high and about 16-24″ wide. If this plant has lots of leaves, it might even feed five to seven caterpillars. You probably already know that monarch caterpillars can eat a lot of milkweed so, if you want a healthy brood, save your seed pods that the plant produces in the fall. You can then plant your own little seedlings into your garden in April. Well, sure enough the next day – within twenty four hours – a female monarch butterfly found my plant. She even laid eggs on it. I was so excited, I just couldn’t believe all I had to do was to put the plant in my garden and they would come to it. How wonderful to be visited by such a jewel of nature. So believe me when I tell you that all you have to do is to introduce the specific plants listed on our butterfly gardening brochure to your garden and you too will have jeweled visitors glistening in the sun. They are a delight to the eye and a splendid conversational topic when you have the neighbors over for a summer barbeque. Your neighbors will want to know how you attracted them to your yard and you can share your splendid butterfly gardening tips with them. Gardeners make great friends! Monarch Watch is an exceptional website – very user friendly, safe for students, often utilized by teachers and because it is so special – it is also listed as a helpful resource on the back of our Cockrell Butterfly Center Butterfly Gardening Brochure. The Cockrell Butterfly Gardening Brochure, graciously underwritten by The Garden Club of Houston, is always available to our visitors at the Cockrell Butterfly Center entrance. The brochure is also available online. The Collector’s Gift Shop inside the museum’s main hall, near the Cockrell Butterfly Center, has a plant cart outside of its entrance door which always has a supply of the gardening brochures available free to the public. For a small cost, gardening enthusiasts can also purchase The Plants of the Cockrell Butterfly Center, a special work put together for visitors, teachers, students, and parents to use as an identification tool within the rainforest environment. Plants that are identified in this book are noted in the rainforest conservatory with numbered red tags affixed to specific plant specimens for easy identification. We are so happy to know you are enjoying our blog. In future blogs, I hope to write about each of the host and nectar plants in our brochure, so that you too can become an expert. Questions about butterflies or butterfly gardening? E-mail us at: bfly_questions@hmns.org. Ory is the Greenhouse Manager/Rearing Coordinator for the Cockrell Butterfly Center. Didn’t know there was a greenhouse at the Museum? She raises 20,000 Heliconius longwing butterflies there, as well as thousands of host and nectar plants for butterfly gardening. Check out her posts for more information on gardening with nature.